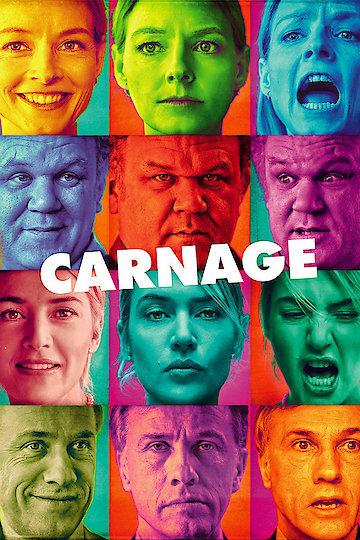 "A new comedy of no manners"
Carnage is a 2011 comedy movie that shows how even grown ups can act like children and be immature. Two grade school boys named Zachary Cowan and Ethan Longstreet are reaching puberty and acting out on their new moods. Since they are aging and getting into new things, they start to argue about it and in the end, Zachary hits Ethan across the face with a stick he finds in the Brooklyn Park. Since Ethan's face is injured with the possibly of a couple of his teeth being permanently gone, Ethan's parents are flooded with worry and concern over what has happened to their child. After harsh questioning to get their son to talk, Ethan's parents, Michael and Penelope Longstreet, decide to take matters into their own hands and invite Zachary Cowan's parents over so that they can talk as adults and get the situation over with in a civilized manner. When Nancy, an investment broker and her husband Alan Cowan come over to the Longstreet's residence, it is revealed that not only do their careers set them apart (Penelope is a writer and Michael is a salesman), but also their personalities and how they handle things. This is shown because the Longstreet's and Cowan's purpose is to challenge each other as parents and to settle their boys' fight. The Longstreet's and the Cowan's continue to argue over their parenting skills and the boys, but after a little bonding over some scotch and a couple funny incidents, they are mellow with each other. However, a drunk Nancy spills the news that she is proud that her son, Zachary, beat up Penelope and Alan's son, Ethan. After this, the parents realize that their discussion has not changed anything and that nothing good will happen with each other. Carnage is currently available to watch and stream, download, buy on demand at Amazon Prime, Amazon, Vudu, Google Play, FandangoNow, iTunes, YouTube VOD online.